Precise delineation of vertebrobasilar ischemia by computed tomography (CT) appears difficult due to the numerous variations in distribution of the posterior fossa arterial supply. While pontine and upper brainstem infarctions can be readily demonstrated, medullary infarction remains beyond the scope of present CT scanners. CT findings in cases of basilar artery occlusion include bilateral pontine infarction or extensive brainstem ischemia, associated with cerebellar and posterior cerebral vascular damage. Demonstration of basilar artery occlusion using routine CT is only rarely achieved. 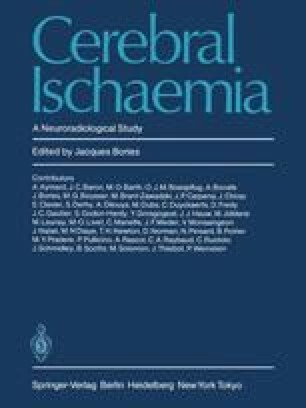 In cerebellar ischemia, CT, in conjunction with clinical syndromes, helps in the recognition of the arterial territory involved. CT provides useful guidelines for the treatment of cerebellar stroke, leading to surgery in cases of massive cerebellar infarction.